Master of the Wind is an RPG Maker classic. It’s an absolutely massive game, with top-notch dungeon design (with puzzles more like a Zelda game than a typical RPG) and wonderfully-written characters. It’s moral stance is a bit heavy, and one that I disagree with, but I love it anyway. Imo that says a lot about the strength of the writing. 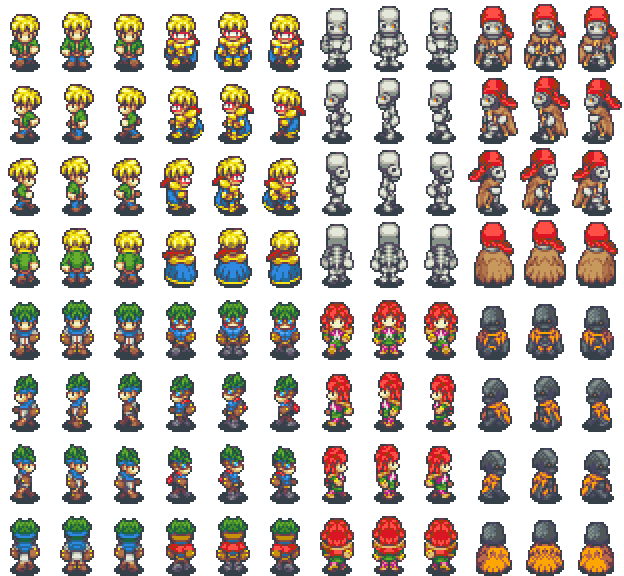 I couldn’t resist making some Time Fantasy style sprites based on the characters from the game. I talked to one of the creators of the game, and I’ve got permission to share them with you. I think that the sprites are versatile enough to use them in your own projects, or maybe include cameos from MotW*. Enjoy. See you next time. * Since these are based on characters from a game, I’m afraid that they can’t be used in commercial projects. However, if you edit/recolor them or use them in a generic way (for example as nobody NPCs or a generic enemy) or something like that, then I doubt anybody is gonna stop you.